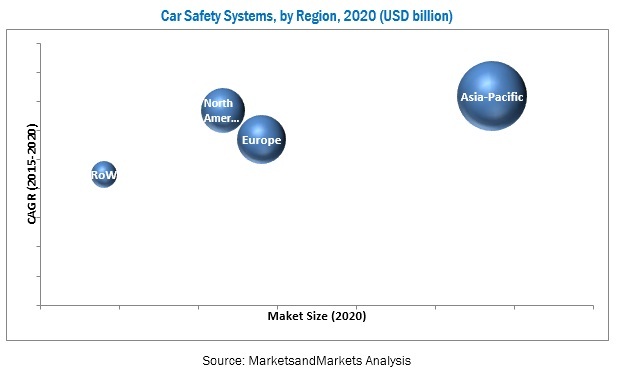 [130 Pages Report] The car safety systems market is estimated to be USD 93.73 Billion in 2015, and is projected to reach 152.59 Billion by 2020, growing at a CAGR of 10.24%. Car safety regulations are a set of guidelines/protocols for automotive component/vehicle design, manufacturing equipment, and safety systems. The primary objective of these regulations is to minimize the occurrence and consequences of automobile accidents. The car safety systems market, by value, is projected to grow at a CAGR of 10.24% from 2015 to 2020. This growth can be attributed to the impact of current and future safety regulations and growing awareness regarding safety systems among consumers. This report covers existing and future car safety regulations in various countries and regions, segmented by occupant type and application. The report also outlines planned car safety regulations to be imposed in various countries and their potential impact on stakeholders. Active safety systems play a key role in preventing incidents and accidents, whereas passive safety systems help to mitigate negative consequences in the event of a crash. Active safety systems consist of various subsystems, such as anti-lock braking, electronic stability control, and tire pressure-monitoring systems. Passive safety systems, such as airbags and seat belts, have proven to be very effective in minimizing the risk of injury in an accident. The research methodology used in the report involves various secondary sources, including paid databases and directories. Experts from related industries and suppliers have been interviewed to understand the future trends of the automotive passenger safety systems market. The research design comprises current car passenger safety regulations enforced in different regions and countries, along with planned car safety regulations and their potential impact on the overall automotive industry and its stakeholders. Regions covered include Asia-Pacific, Europe, North America, and the Rest of the World. Information regarding current and planned regulations has been gathered from various secondary and primary sources, and their impact on the automotive value chain has been identified through extensive primary and secondary research. Primary research interviews have been conducted with key opinion leaders in the automotive industry, regulatory bodies, agencies, and other executives such as CEOs, directors, and industry experts to validate findings in the study. To define and describe the existing and future passenger safety systems, by application. This research study involves the use of secondary sources such as company annual reports/presentations, industry association publications, automotive magazine articles, directories, technical handbooks, World Economic Outlook, trade websites, technical articles, and databases such as Hoover’s, Bloomberg Businessweek, and Factiva to identify and collect information for an extensive commercial study of the automotive battery sensor market. The primary sources comprise industry experts, engineers, product managers, R&D managers, automobile OEMs, safety systems manufacturers, software providers and sales managers. In-depth interviews have been conducted with various primary respondents, including key industry participants, subject-matter experts, technical experts, car safety experts of major market players, and industry consultants to obtain and verify critical qualitative and quantitative information as well as to assess prospects. The figure provided below illustrates the break-up of the profile of industry experts who participated in primary discussions. Which type of safety system will lead the car safety market in future? What are the future plans of key regulatory bodies pertaining to road safety? Which are the key players in car safety market? The car safety system ecosystems consists of manufacturers such as Continental AG (Germany), Denso Corporation (Japan), Delphi Automotive PLC (U.K.), Robert Bosch GmbH (Germany), and Toyoda Gosei Co. Ltd. (Japan), research institutes such as The Automotive Research Association of India (ARAI), European Automotive Research Partners Association (EARPA), and The United States Council for Automotive Research (USCAR), and regional automobile associations such as China Association of Automobile Manufacturers (CAAM), Japan Automobile Manufacturers Association (JAMA), and the European Automobile Manufacturers Association (ACEA). By Region (North America, Asia-Pacific, Europe, and RoW). Active safety systems play a key role in preventing incidents and accidents, whereas passive safety systems help to mitigate negative consequences in the event of a crash. Active safety systems consist of various subsystems, such as anti-lock braking, electronic stability control, and tire pressure-monitoring systems. All these systems are triggered at different times based on various circumstances, to prevent accidents. The systems are mandatory in most developed countries, and legislations in developing countries are rapidly catching up. However, other active safety systems, such as lane departure warning, adaptive cruise control, driver monitoring, blind spot detection, and night vision systems are primarily implemented in the premium car segment. Asia-Pacific is projected to grow at the highest CAGR during the forecast period, as a result of the high demand for vehicles, especially from countries such as China and India. Several OEMs are investing in the region, prompted by factors such as the expanding middle class and the young demographic. Passenger car production is expected to grow in countries such as China and India, owing to availability of cost-effective labor and favorable government policies. For instance, the Government of India has allowed 100% foreign direct investment (FDI) with no minimum investment criteria for the automotive sector. The region houses OEMs such as Toyota (Japan), Hyundai Motor Company (South Korea), and Honda Motor Company (Japan). Additionally, certain countries in Asia-Pacific, such as South Korea and Japan, have strong technological capabilities. The market for car safety systems is mainly driven by legislation mandating safety technology installation in vehicles. The New Car Assessment Program (NCAP) is a government car safety evaluation program that provides ratings based on the safety performance of cars. The program has become a catalyst in encouraging significant safety improvement initiatives from OEMs, which drives consumer confidence and consequently, demand. The growing focus of consumers and OEMs on occupant safety increases the number of technology installations per vehicle. Electronic Stability Control (ESC) is a system that detects if the vehicle is about to lose traction during turning and braking, and electronically adjusts the braking of individual wheels to maintain vehicle traction and stability. ESC is very effective in case of accidents, skidding, and so on, as it helps the driver maintain control of the car, thereby preventing or reducing the severity of crashes. ESC was made mandatory by the European New Car Assessment program in the year 2009. AEB helps the driver to avoid a crash by providing a warning, and either helps with adequate braking or ultimately stops the vehicle. The AEB system uses ESC and sensor technology to analyze the speed and distance of objects in the vehicle’s path. The system then automatically applies the brakes if the driver does not respond to avoid or minimize the severity of an accident. AEB is currently implemented in around 7% of new cars manufactured, which indicates that the market for AEB has substantial growth potential. Active or Adaptive Cruise Control (ACC) is an intelligent system that automatically slows down and speeds up the vehicle to keep up with the car in front. The system uses a radar or similar technology to analyze the vehicles travelling in the same lane ahead, and either reduces or increases the vehicle speed to maintain a safe and suitable distance between the two vehicles. ACC is now paired with a pre-crash system that alerts the driver in case of a probable crash. The radar commonly used for ACC is automotive long-range radar (LRR). This kind of radar occupies a bandwidth of around 77 GHz. In the remodeled 1999 model S-class luxury cars introduced by Mercedes-Benz, the ACC system uses a 77-GHz Doppler radar linked to the electronic control and braking systems. Vehicle to Vehicle (V2V) and Vehicle to Infrastructure (V2I) are advanced communication systems, which enable vehicles to communicate with other vehicles and infrastructures nearby. The systems provide drivers with information regarding upcoming hazards, emergency vehicles, and traffic light changes. The primary goal of V2V communication is preventing accidents. This goal is achieved by allowing moving vehicles to share position and speed data with one another over an ad hoc mesh network. A short-range radar (SRR) is commonly used to establish communication between the vehicles. The radar works at a bandwidth of 24 GHz and 79 GHz. The 79 GHz bandwidth is a long-term operating frequency for SRR. Security is therefore a key challenge with V2V technology design. Blind spot detection is a technology that provides 360 degrees of coverage around the car. The blind spot detection (BSD) system was initially developed by Volvo. The system tracks traffic just behind the vehicle, as well as the traffic alongside it. The alert stays active until the vehicle in the adjacent lane is in front, or at least directly alongside the car. BSD uses ultrasonic or radar sensors, which are located at the side and rear of the car. A blind spot monitoring system uses an electronic detection device mounted on the sides of the car, which sends electronic electromagnetic waves or computer-processed images. When detectors notice another vehicle closing in on the car, the system alerts the driver. In the new, advanced systems, the car will steer itself back into the safety zone of its previous lane. The lane departure warning system tracks whether the vehicle is appropriately within a lane. It uses a forward-facing camera in the rearview mirror mount, and is hence an optical system. If the vehicle enters another lane, the system gives a visual alert on the dashboard and an audible alert or a steering wheel or seat bottom vibration. If the turn signal of the vehicle is on, the system does not give any alert. The latest technologies use a set of laser or infrared sensors to track the lane of the vehicle. These technologies are expensive, but are more effective with regard to tracking. The parking assistance system is one of the most intelligent systems currently available in the market. These systems enable the vehicle to steer itself into a parking lot without any action by the driver. The system uses cameras and sensors to analyze the parking space available and automatically steers the vehicle into the space with precision. The parking assistance system judges the size of a parking space and informs the driver if the space is suitable or not. The system can park the car in different locations, such as parking lots, roadside parking slots, and others. The latest automatic parking system by Bosch can steer the vehicle with the driver standing outside the vehicle. The driver just has to hold a button on his mobile application and the car parks itself. The system uses ultrasound sensors located at the side of the vehicle. These sensors scan the surroundings and calculate the perfect parking manoeuvres. A Heads-Up Display (HUD) is a digital transparent image, which is projected onto the windshield of a car. The information displayed is the same information the driver would get from the dashboard. This can include everything from the current speed to various temperature gauges. The motive behind the heads-up display is to prevent any kind of distraction caused to the driver in case of a dashboard display. 10.3 Toyoda Gosei Co., Ltd. Figure 26 Fatal Crashes in the U.S. Figure 27 Expansion Was the Key Growth Strategy During the Past Three Years. Figure 35 SWOT Analysis: Toyoda Gosei Co., Ltd.